Dorothy Wall, author, illustrator and creator of the much-loved children’s book, Blinky Bill, was born on 12 January 1894 in Wellington, New Zealand, and first migrated to Australia in 1914. She died on 21 January 1942 at her home in Cremorne and was buried in the Northern Suburbs Cemetery. 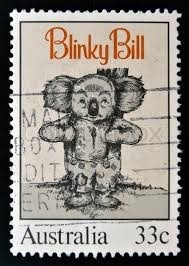 In 1985, Australia Post issued a commemorative stamp honouring the character Blinky Bill. Have you read any of Wall’s work. What did you think?